Would you like to order a nice design side table for your living room? In that case, it goes without saying that you would like to make a choice from a very wide range of interesting options. That is not a problem at all. After all, we from Nordic New offer our customers a wide range of products packed with the most beautiful design side tables that can often be purchased at a surprisingly interesting price. 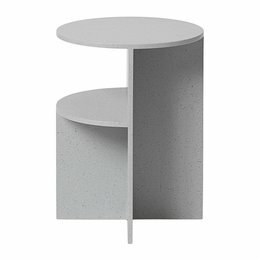 So do you want to order a design side table in other words? Do not hesitate any longer, take a look at our offer and get your design side table today! There are so many furniture that many people do not have in their home, but still can provide an interesting added value. A design side table is such a piece of furniture. You can also use such a small table for a wide variety of applications. You can especially choose to put a nice collection of magazines on, but in addition you can also put a tasty aperitif on when you have visitors. In any case, the fact is that a design side table not only creates a visual but also a practical added value that you will undoubtedly enjoy. Today, a side table can of course be found on the market in many different forms. As owner of a home you can also choose to simply order a simple table, but it is so much more interesting to opt for a design side table. Such a side table is not only practical, but also has a very nice look. Add to that the majority of our design side tables are easy to maintain and you immediately have a number of excellent reasons to choose to also have a copy at home. Do you also want to have a design side table in your home? Many people have been thinking about it for quite some time now, but have never wanted to take the step to order a design side table. It is now time to change that. The wide range of Nordic New ensures that you have the opportunity to order exactly that design side table that comes into its own in your interior. But that is not all. We do not only guarantee our customers an impressive design, in addition, design side tables can also be ordered with us at the lowest possible price. Add to that also that no shipping costs are charged for delivery in the Netherlands and Belgium and you immediately have enough excellent reasons to choose to also order your brand new designer side table here at Nordic New!